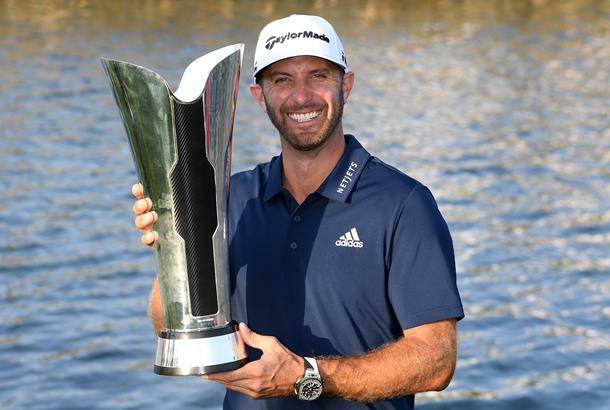 Dustin Johnson recovered from a late mistake with back-to-back birdies on his final two holes to hold off challenges from Haotong Li and an in-form Tom Lewis to secure his first win in a regular European Tour event on 19-under-par. "I am pleased with the outcome, but feel I should have played a lot better," said Johnson, whose victory means he will move back to No.2 in the world rankings ahead of Brooks Koepka. "I am pleased to get back to number two and hope there is more to come in the next few weeks." DJ began the final round of the controversial tournament in a share of the lead with Li but quickly moved ahead with a birdie on the second hole of the day, only for Li to draw level with the former World No.1 two holes later. It was the Chinese player who held the advantage at the turn, posting his second birdie of the day on the 9th to go one shot clear, with England’s Tom Lewis hot on their heels thanks to opening with five consecutive birdies. But Li was unable to recapture the form that saw him card four eagles during his round on Saturday, slipping back with three dropped shots over his next five holes to end up three behind as Johnson added two birdies and a bogey in that same span of holes. A birdie on the 15th edged Li back a little closer, and he pulled to within one shot after Johnson ended up in the ocean with his tee shot on the par-three 16th, and did well to hole from 10-feet to walk off with a bogey. With a one-shot lead, Johnson opted to take driver on the short 17th and came up just shy of the green, resulting in a two-putt birdie while Li scrambled for his par. Both men made birdies at the final hole of the day, leaving Li in solo second by a shot after Lewis couldn’t improve on a run of six pars on his closing holes. For Johnson the win was a satisfying one, and he hopes it will act as a springboard for a strong few weeks in the United States. "it feels really good,” Johnson said. “Any time you can win a professional golf tournament, no matter where it is in the world, it's a big win. I'm honoured to be the champion, and I'm very pleased with the win. “You know, I'm heading back to the States tonight, and you know, I've got three big weeks in a row. I've got Pebble, L.A. and México coming up. You know, to win here, obviously the game is in good form, and I'm heading into three really big weeks for me. Behind Lewis, Min Woo Lee claimed fourth place on 15-under, with France’s Alex Levy finished a shot further back. A pack of five players including Ian Poulter and Bryson DeChambeau rounded out the top 10 on 11-under par.